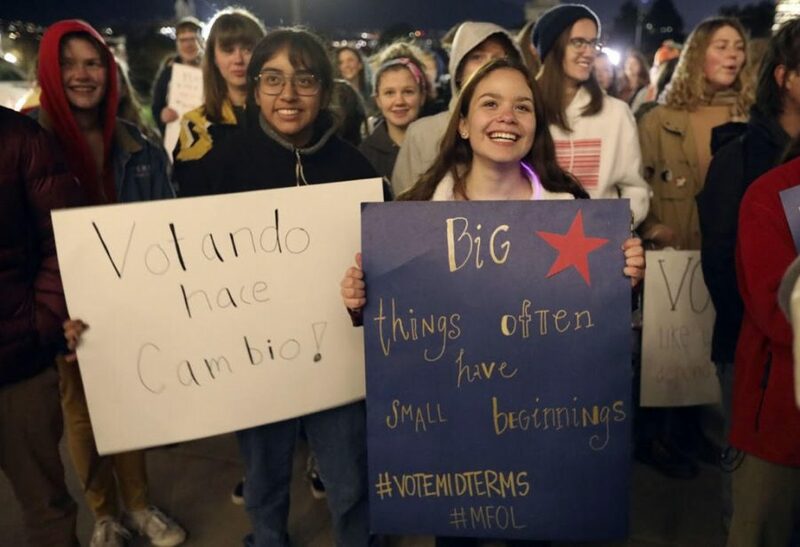 On November 5, teenagers rallied on the steps of Utah’s state Capital in an effort to spark excitement for voting in the 2018 midterm election. This event was sponsored by the March For Our Lives organization and was put together by their board of youth activists. Although the weather was bitter and less than ideal, their enthusiasm for voting did not hinder. The event was complete with musical performances, keynote speakers, chants, and even an open mic for the youth. Among the many reasons for this event to be held, the biggest reason was to spread awareness of the importance of voting- especially in midterm elections. Although the majority of the crowd was made up of teenagers, there were still quite a few adults that shared their passion for voting. A large number of teenagers that showed up and participated in the rally are too young to vote but are still extremely passionate about political issues. This voter rally brought together people of all ages who share the knowledge of how powerful voting is. This event was not promoting any particular political party; organizers said that they intended for it to be a nonpartisan event. The mission was not to sway voters in the direction of conservative/liberal or Democrat/Republican. They simply wanted to educate everyone on the importance of voting. Asha Pruitt, a Skyline High School senior and an organizer of this event said that “Voting is not just our right, it’s our civic duty.” Asha spoke about how excited she was to finally be able to vote now that she has recently turned 18. She also told the crowd just how patriotic it is to vote as a citizen of the United States. There were a few 18-year-old speakers like Asha; they all talked about the feeling of joy and liberation that voting has given them. Not everyone is eligible to vote, so a lot of them showed up with the hope that voters will hear them. Daud Mumin, another organizer of this event passionately told the crowd that “Politics isn’t just about gun reform, immigration or abortion rights. It’s about everything. Our health care, our safety, our education, our roads, and our teachers. Voting affects all of us whether we participate or not.” With the intentions of inspiring voters, Mumin spoke about how widespread the effects of voting are. Because these teens do not have a direct voice, they wanted to speak about the issues that they are passionate about. Chants such as “Whose streets? Our streets,” “The people united will never be defeated,” and “vote, vote, vote” were passionately yelled and rang on the steps of the capital. The organizers wanted to make the point that this state belongs to the people, and how important it is for the people to have a voice. Through their compelling enthusiasm, everyone that turned out to this rally showed just how important voting is.